Eating Donatos Pizza is always rewarding. The flavor. The great times together with friends and family. 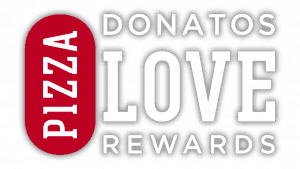 And with Donatos Pizza Love Rewards, every order gets you closer to a reward—plus, you’ll get a free 12” pizza for your birthday*! You’ll earn points every time you order. Recruit friends or share opinions to earn even more! Accumulate points for access to members-only benefits. And, once you place your first order as a member, you’ll be eligible for a free birthday pizza*! *12″ 1-topping pizza. First order as a member must be placed within 2 weeks of your birthday. When you’ve earned a reward, we’ll let you know, and it’ll be ready to use when you log in and order. When friends join via your unique link, you get 300 points when they order. Earn points for every dollar you spend on your favorite menu items. Visit donatos.com/rewardsfaq for more information.